When I first saw the photo of Santa standing over a wrecked vintage Porsche in New York City (above) I thought it all seemed just a little too perfect. I even assumed it was maybe a commercial shoot. It wasn't. Now Santa's chimed in to explain exactly what happened. 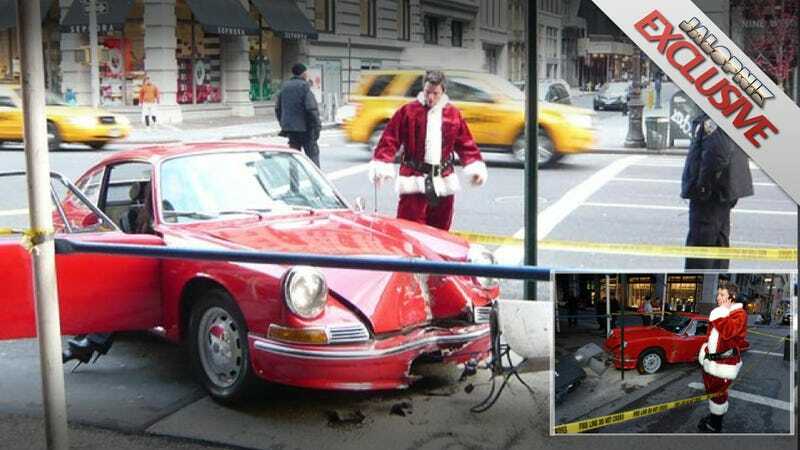 Why did Santa crash his vintage Porsche on 5th Avenue? The image popped up over at CarBuzz and on forums the day after Christmas with forum-goers curious over what happened. After posting it myself here the commenters pointed out that it had actually happened in 2008 but went largely unnoticed. My first hint that it maybe happened in 2008 was that I didn't get 400 tweets about it, a shock nowadays considering it happened on 5th Avenue and 19th Street in busy New York City. A day after posting it, Sam Cox emailed me to fess up to being the crashing Santa and explain the car was a 912 and not a 911. I wasn't going to leave it at that, so I emailed him back imploring him to share and apologizing for "poking" him "where it still may be sore." Car is a 1966 912. 30th birthday present to myself. This was my third time driving the car if you include the test drive, so I admit I didn't have a lot of wheel time. My girlfriend and I were on our way to a Christmas party when we were sideswiped by a cab, and run off the road into a pedestrian crossing signal. The photos say the rest, but needless to say the frame was straight so my lady told me to go for it and rebuild the car — even though we live in NYC. (SWB) no BS carburated engines. It was pretty cool, and I met a lot of great guys who gave me deals on parts and tips on resto. I had guys sending me stuff via greyhound, and contractors on the street boxing out room for me to work. I had some of the body work done at a shop a friend recommended, and I made some great friends with awesome mechanics who were very patient with the kid with the car older than himself. I rebuilt the front end and added an engine rebuilt by HCP research that was an awesome engine to find through Don Ahearn who does a lot of classic Porsche racing. I still love and drive the car, and i still get a lot of crap from friends about these photos. Can't believe they turned up online. The Internet will always find you! Cox is so cool about taking this minor tragedy and turning it into a major learning experience I'm going to try not to be jealous that his girlfriend (the one in the high heels) encouraged him to restore it.